And I only attended half of the workshop weekend. But I should start from the beginning. I started an exercise class last week with my counterpart’s mom, Oksana. It’s a combination of belly dance, step aerobics, and light strength/stretching. A fun and active thing to do in my community! Anyway, when Oksana and the ladies in the exercise class heard that I practice yoga, they immediately invited me to a Kundalini Yoga workshop this weekend in Sniatyn. “Why not?” I asked myself — I had only done a few short Kundalini podcasts so didn’t know much about this style of yoga at all and thought it would be another great way to move my body and meet others from my town. An uplifting blend of spiritual and physical practices, this yoga style incorporates movement, dynamic breathing techniques, meditation, and the chanting of mantras, such as Sat nam (“I am truth”). The goal is to build physical vitality and increase consciousness. The sort of governing body of Kundalini Yoga is the 3HO Foundation (happy, healthy, holy organization), based in New Mexico but overseeing Kundalini worldwide. The physical aspect of the practice involves repetitive movements — one move repeated for 2-5 minutes — with coordinated breathing (of course — this is yoga). Doesn’t sound that hard, but you try wiggling your elbows up and down for 5 minutes with your hands clasped in front of your chest! Kundalini emphasizes the spiritual aspect of the practice much more than any yoga I’ve ever done. 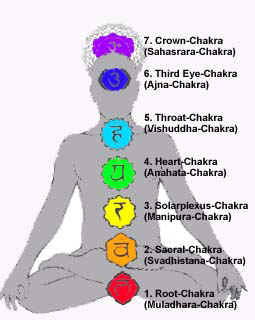 Part of the practice strives to align or balance the chakras (the energy forces in the body — see picture below or click the link for the Wikipedia article). The spiritual is also brought out through chanting mantras, sometimes accompanying physical movements and sometimes while sitting in Simple Pose (Sukhasana in Sanskrit, or cross-legged) and holding the hands in a certain position. Some mantras I remember chanting include Sat nam (“I am truth”); Har (God in Sanskrit); “I and God, God and I are one”; “I am happy, I am healthy, I am holy.” There’s also a good deal of talk about healthy lifestyles. We did all of the above and more with Дима (Dima), a Kundalini Yoga teacher who came all the way from Odessa (that’s in southern Ukraine, near Crimea — it’s warm there) to give this workshop. A point about Odessa: it’s a largely Russian-speaking city. So while I’d expected the workshop to be taught in Ukrainian, I was a bit surprised when Dima started speaking Russian. Now, the two languages are not all that different, and I picked up a bit of Russian from the Surzhyk that my host parents during training spoke, but I did have to work a little harder to understand. Another surprise to me was how the schedule unfolded: I figured there would be one long-ish session per day. Not so! Below is the breakdown of the sessions I attended. Friday: 6-9:30pm. Dima talked about living a healthy lifestyle and introduced the chakras. We actively practiced for just over 2 hours, part physical & part mantras, including savasana (corpse post) with Dima methodically ringing a big gong. Saturday: Practice #1: 5-8:30am! So much for sleeping in after my first week of teaching. It was a nice way to wake up, though. Dima read in Russian for a while, not much of which I understood. Then we did a physical practice for 1.25 hours, and after that we spent another 1.25 hours singing mantras along with music, which was pretty awesome — after a while the repetition becomes a comfortable rhythm. Saturday: Practice #2: 11am-2:30pm. This session was the one that made me decide not to finish out the weekend. It started well, with 30 minutes of repeating a sequence while chanting “Har, Har, Har…” It was even a little bit aerobic. But the rest of the 2.5 hours were mostly Dima talking at us in Russian — he speaks well, and talked (as far as I could tell) about living a healthy life, benefits of eating certain foods, etc. Long story short, two hours of sitting and struggling to understand Russian, with a few short meditation sessions in between, was enough for me after the early morning. There was also a 5pm session scheduled for Saturday, and I assume three more on Sunday, but I was so wiped out from 10.5 hours of workshop in a 20-hour period that I opted out. I learned a lot about Kundalini Yoga this weekend, and decided that it’s not for me. After sitting cross-legged and listening/chanting/meditating for two hours, I never missed Power Vinyasa so much! (And PV isn’t even my first choice of style.) Let’s just say I’m too antsy a person to practice all aspects of Kundalini. Part of this was probably due to not understanding half of what Dima said. But I think I’ll return to my Iyengar/Anusara/Vinyasa hybrid practice and perhaps incorporate some of the physical Kundalini movements. This entry was posted in community, exercise, language on 15.01.2011 by taplatt.